Microsoft’s Windows Insider team are putting finishing touches to the current preview builds in testing. The latest Windows 10 Insider Preview build 17751 released, no longer has the build watermark on the desktop. This means we are almost at the finish line, where it gets generally available to the public. Microsoft also announced at IFA Berlin trade show that the current Windows 10 RS5 build will officially be known as the October 2018 Update. So we start counting down to its release. At Microsoft Build this year Microsoft talked about its vision and strategy for its platforms including Windows. The fusion of Windows and Office in the Microsoft 365 platform. Some of these features Microsoft says are necessary as our world grows into a multi-sense and multi-device world. These features in as much as try to help you save time and be productive have the new sense of Microsoft. Meeting customers where they are and connecting customers PC experiences with their phones. Let’s take a look at what has been in testing for a while and Microsoft’s plans with it. Earlier we highlighted Mixed Reality Flashlight, New Emoji’s in a post. If I haven’t included a feature you know of and like, kindly share that with us in the comments. I’ll update post with it. Thank you. This feature was announced and demoed at Build 2018 as “your phone” and looks pretty helpful. It helps connect your phone to your PC. Making it easy to access the contents of your phone. Easy access to notifications, text messages, photos, etc. using your PC instead of picking up your phone to do this. No matter your device, iOS or Android, “Your phone app helps you to link your phone to your PC. Surf the web on your phone, then send the webpage instantly to your computer to pick up where you left off to continue what you’re doing–read, watch, or browse with all the benefits of a bigger screen. 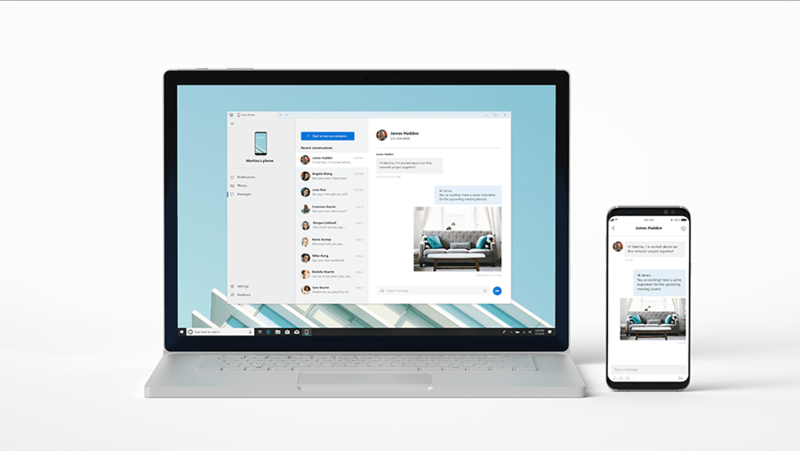 “There’s a new way to connect your phone to your PC with Windows 10 that enables instant access to text messages, photos, and notifications. Imagine being able to quickly drag and drop your phone’s photos into a document on your PC in one swift movement – without having to take your phone out of your pocket. Today, this experience allows you to link your phone to your PC. Surf the web on your phone, then send the webpage instantly to your PC to pick up where you left off to continue what you’re doing–read, watch, or browse with all the benefits of a bigger screen. With a linked phone, continuing on your PC is one share away“. There have been calls for changes in Skype ever since ever. Some felt it wasn’t lite enough to use etc.. Then other messengers came on the block like WhatsApp, Telegram, Viber etc. Skype lost most of their users. I don’t want to say skype was business focused. Looks like Skype finally has a friendly consumer version. Try it when the update rolls out if you haven’t already in the preview and come tell me what you think. Microsoft lists out some of the changes it has made to the application. Flexible group call canvas – Customize your group call experience and decide who appears in the main call canvas. Simply drag and drop people between call canvas and the overflow ribbon to select who you want to focus on. Take snapshots – Use snapshots to capture images of important moments within a call. Snapshots makes sure you never forget important memories like your grandkid’s funny antics or crucial information like the content that’s been screen shared during a meeting. Easily start screen sharing – We’ve made sharing your screen during calls even easier. Look for the ability to share your screen with the top level call controls. New layout – Based on your feedback, we’ve made your contacts easier to access and view. Customizable themes – Choose a color and theme for your Skype client through or application settings. And much more – Improvements to our media gallery, notifications panel, and @mentions experience and more! The Snipping tool has a big boost. It’s way easier using shortcuts to launch application and get going. The new capabilities with the Sketch app makes editing and transforming the snip even better. One of the loudest things we heard is that you want to be able to quickly snip & share a screenshot. We’re making it happen! WIN + Shift + S will now bring up a snipping toolbar – snip a rectangle, something a bit more freeform, or full screen and it will go straight to your clipboard. If that’s all you need, you can take it from there. Want more, though? Immediately after taking a snip you’ll now get a notification that will take you and your snip to the Screen Sketch app where you can annotate and share away! Press Print Screen. You heard it right, just one button! It’s not enabled by default – go to Keyboard Settings – you’ll see a new option that says “Use the Print Screen key to launch screen snipping”. Opening Settings and searching for “print screen” will take you to the right page. Press the quick action button in Action Center. Called “Screen snip” – it should be there as soon as you upgrade, but if not you can always enable it via Notifications & Actions Settings. Our new settings page for enabling this experience is under Settings > System > Clipboard – please try this out and share feedback! This link will open the Feedback Hub to where you can tell us about your experience and what you’d like to see next. If you’ve been a windows 10 mobile user you’ll be used to the swift key. This feature is finally enabled in tablet mode on Windows 10. SwiftKey will now power the typing experience on Windows when using the touch keyboard to write in English (United States), English (United Kingdom), French (France), German (Germany), Italian (Italy), Spanish (Spain), Portuguese (Brazil), or Russian. These are just a few of the amazing updates coming in Windows 10 RS5 or should I say Windows 10 October 2018 Update. Dark theme in file explorer (above), more fluent designs across the operating system and applications. Microsoft Edge improvements, Xbox and game mode features etc. Share your favourite new feature with us. UPDATE : So i saw somewhere in the feedback hub people requesting your phone gets changed to my phone. It got answered and closed but well in the final push out it remained Your Phone.